Everybody look out! Pac-Man is here! We found this little guy on Craigslist yesterday. We were looking for Alpine does (we still miss Nibbles and want more babies next summer ) but we found this fella instead, and he’s gonna help us get more babies! He’s a nine-month-old 3/4 Nubian, 1/4 Alpine buckling, and he reminded me way too much of Cuzco to pass up. He’s as sweet as he can be, and he’s the perfect size to breed Nubbin and Petunia. He’s about two months older than them but is about the same size. I’m attributing a lot of that to the fact that he was bottle raised, as opposed to our spoiled little brats who were dam raised and allowed to nurse for five months. Pac-Man’s got nice enough conformation that I feel good breeding him to my little gals, and when he’s done with that job we’re going to wether him so he can grow up to be our next hiking buddy and cart puller. Hopefully he agrees with our plan for his life. Pac-Man is very sweet-natured, but a little shy right now. Apparently he was a huge lap baby until puberty hit, and then suddenly he got thrown into the rough-and-tumble world of the buck pen where he was the low man on the totem pole. It made him wary of attention, probably because he got pummeled every time he tried to take center stage. But he’s not skittish or unfriendly–it’s like he really wants to come up to us, but he’s looking over his shoulder the whole time, and he doesn’t want to be caught or restrained. He loves treats, however, so it shouldn’t take long to remind him that people are wonderful creatures. Our new dog is AWESOME!!! Can I please repeat that!?! Our new dog Daisy is AWESOME!!!!!!!!! I’m not sure there are enough exclamation points after that phrase, by the way. 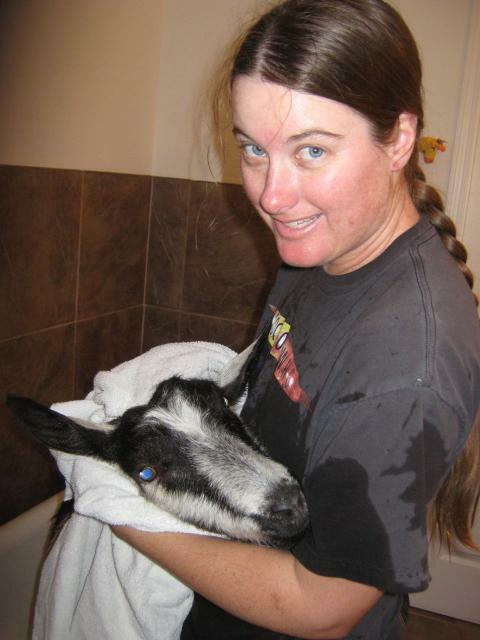 We started letting the goats out during the daytime with Daisy on Christmas day. Before that, we were keeping everybody penned up all the time because I wasn’t sure Daisy would stay home, not knowing this new place or her new herd (which has had a hard time accepting her). But Christmas morning I decided it was time to let them all out to roam for a few hours unsupervised. It went really well. Daisy stayed with the goats except for a few brief forays into the surrounding oak brush to sniff out whatever stuff dogs like to sniff out. She likes to lay down about 20 feet from them, often on a hillock overlooking the area where the goats are grazing. Until today, I had not heard this dog bark even once. Not even when we had company over on Christmas Eve. I was beginning to wonder if we had a dud dog. But I could not be more wrong!!! I let the goats out of their pen around 8:00 this morning and left them puttering around the house as they used to do before we got a dog. We almost never see predators during the day, so I’ve felt relatively safe letting everyone roam while the sun is up. Phil and I were in the office when we heard barking around 9:30 this morning. Daisy was in front of the house barking her head off, hackles raised in a giant puff-ball on her back. There were two coyotes in the front horse pasture. All the goats were behind the house, huddled against the porch railings. Daisy stayed out front and barked and charged viciously until the coyotes ran off with their tails between their legs. 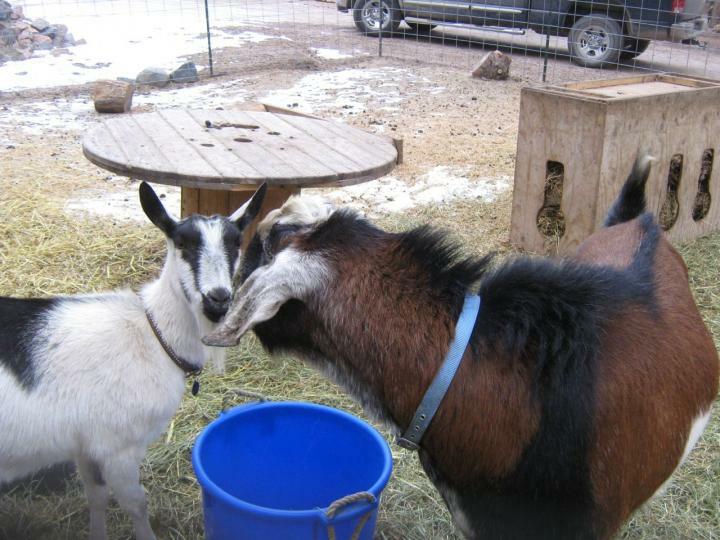 As soon as they were gone, she immediately ran around back to check on the goats. I could not be more proud of this dog and I just had to share! 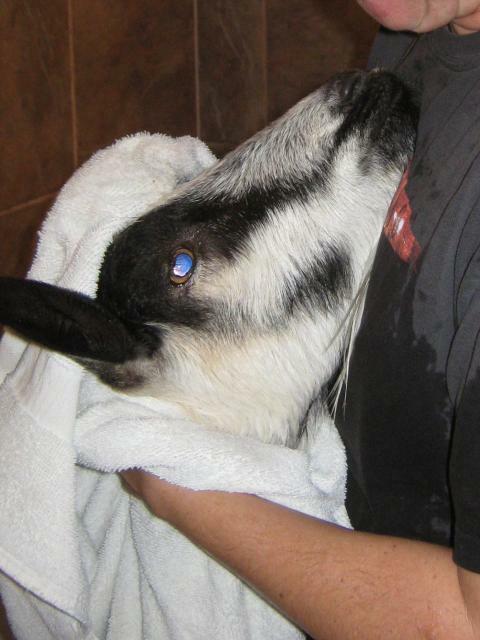 What do you do with a goat that comes home from a romantic interlude with a hot-smellin’ buck in the dead of winter? 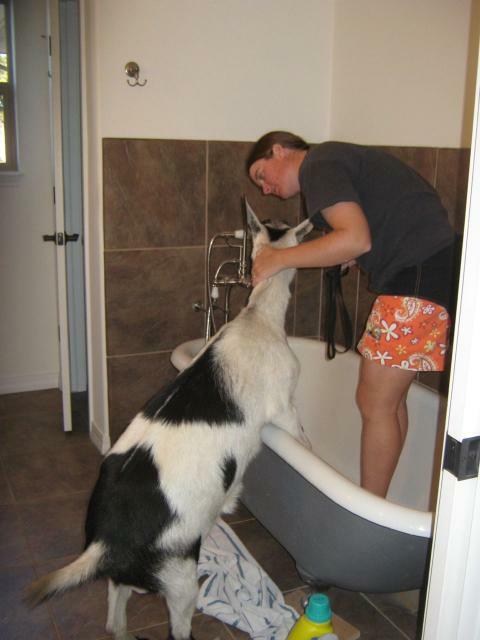 Why, take her into your house for a bath in your claw-foot tub, of course! Please don’t wash away my beautiful perfume! 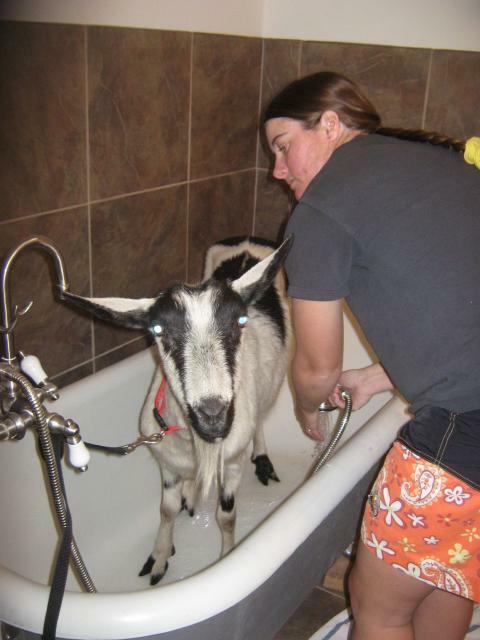 Be thankful the water is warm, goat! 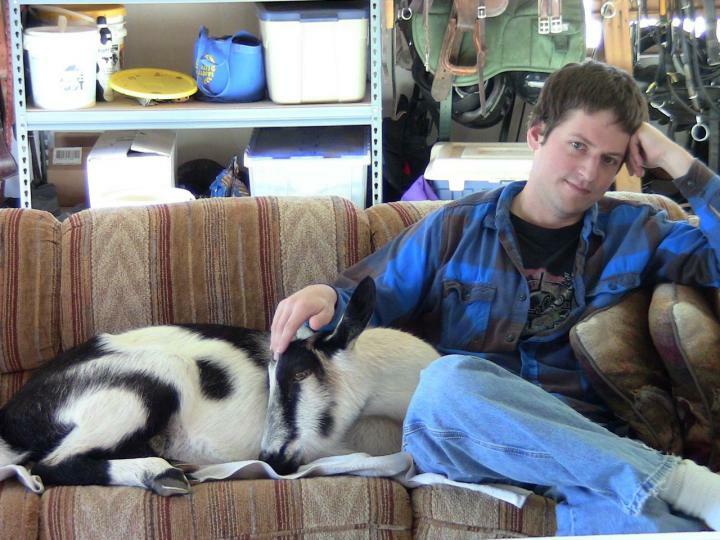 What better place to dry off and get warm than curled up with Phil on the basement couch near the wood stove? Lilly was bitten by the love bug on Saturday, so we called a friend of mine in the dating service and arranged a hookup. Lilly thought she’d make a great impression if she rode like this, but she thought better of it once the truck started moving. This was the guy we tried to hook Lilly up with last year, but his overwhelming size and presence was way too much for our shy little maiden and we ended up going with a six-month old buck owned by the same breeder. This fellow, Nuada, is two years old and took some pretty nice championships this past year, even over much older, more mature bucks. This is Argos, Lilly’s date from last year and Petunia’s daddy. I like Petunia so much I had planned on breeding Lilly again to him this year and using Nuada for Nibbles. But those plans changed when we lost Nibbles, and I figured I’d see how Lilly warmed up to Nuada this year. It’s good to expand the gene pool. 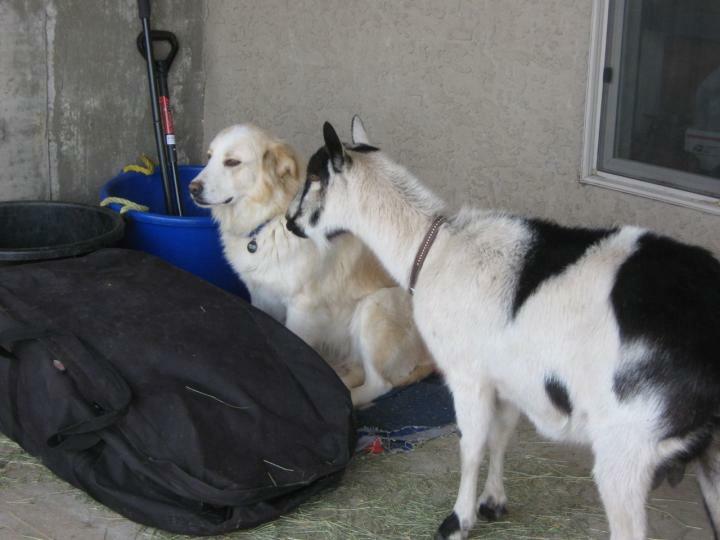 It’s been a hard week, and it might continue to be a bit crazy around here until dog and goats get used to each other. It seems like it’s taking forever, but I have to remind myself that I only introduced them on Friday. It seems like ages ago. Our herd dynamics are definitely changing. Nubbin is still terrified of Daisy and has glued herself to Cuzco. She went into Cuzco’s shed last night and surprisingly, Cuzco let her stay. Cuzco is still terrified of Daisy. Every time the dog moves, a bird flies by, the wind blows, or I open the door, that poor goat jumps a mile and all his hair stands up. However, yesterday he started channeling that fear into aggression toward Daisy. He was terrorizing her last night during feeding time and wouldn’t let her come near me. I guess after he realized he can’t run from the dog, he’s going to make the dog run from him. 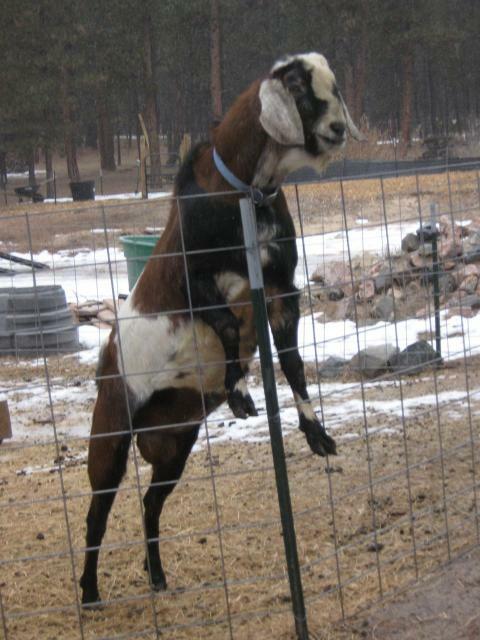 By evening time, Daisy was afraid to be in the goat pen and started to whine and dig at the gate when I left. She gave up after a few scratches at the surface, but if this keeps up I’m going to run hotwire along the ground. She and Cuzco are just going to have to figure out how to co-exist. I’m glad Daisy isn’t aggressive with the goats, but with a beast like Cuzco in the pen, she’s going to have to stand up for herself. Daisy spent all day with the goats and I feel comfortable leaving her there tonight. She stopped being scared of the goats this morning when she realized that Cuzco was more afraid of her than she was of him. I don’t think she’d ever seen a monster that size. Cuzco’s hair has been puffed up all day, and I don’t think he laid down once. Nubbin has glued herself to him in the mistaken belief that he’s the most likely to protect her from this new menace. 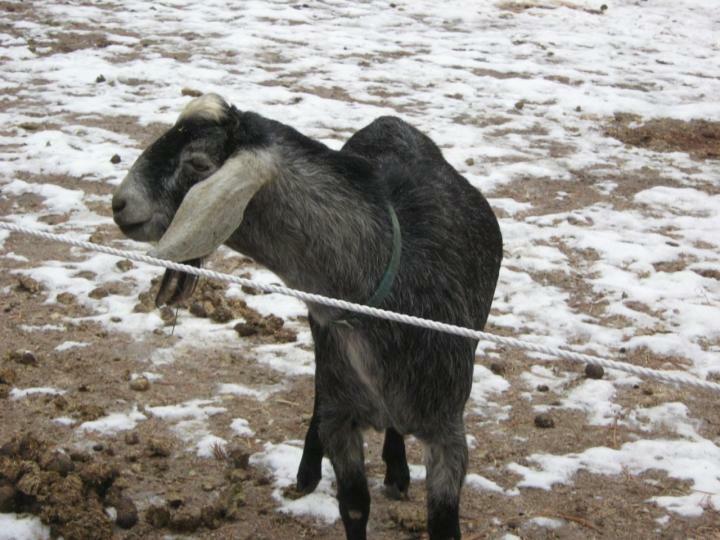 Silly goat! She ought to realize that of all the creatures in the pen, Cuzco is the most likely to damage her. Lilly was aggressive with Daisy this morning, but Daisy would only lie down in a submissive pose when Lilly approached her, and she would slink quietly away if Lilly hit her. So by now Lilly has decided that the dog is an uninteresting object and is already mostly bored of her. I sat on the edge of the stanchion and tried to get Petunia to sniff noses with Daisy this morning. The second that dog touched Petunia, she leaped into my lap and started shaking like a leaf. I held onto her while Daisy gently licked Petunia’s nose. I thought it was sweet. Petunia wasn’t sure what to think, but I’m pretty sure she didn’t care for dog breath. I picked up Daisy the guard dog this afternoon, and I hope she lives up to the hype. 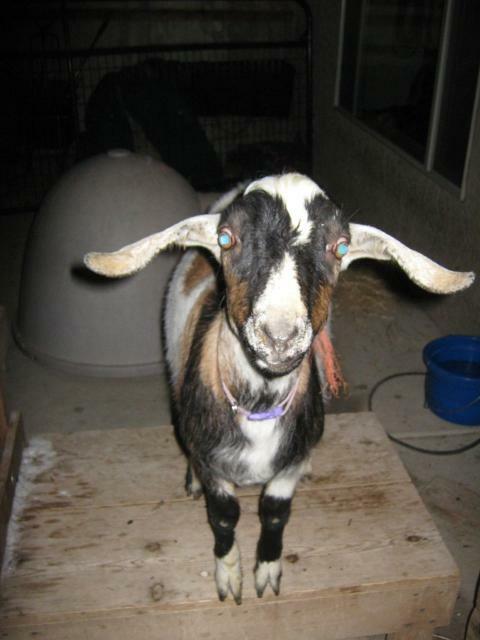 I found her on Craigslist–“free to good home.” She’s three years old and has been a goat guardian her whole life. 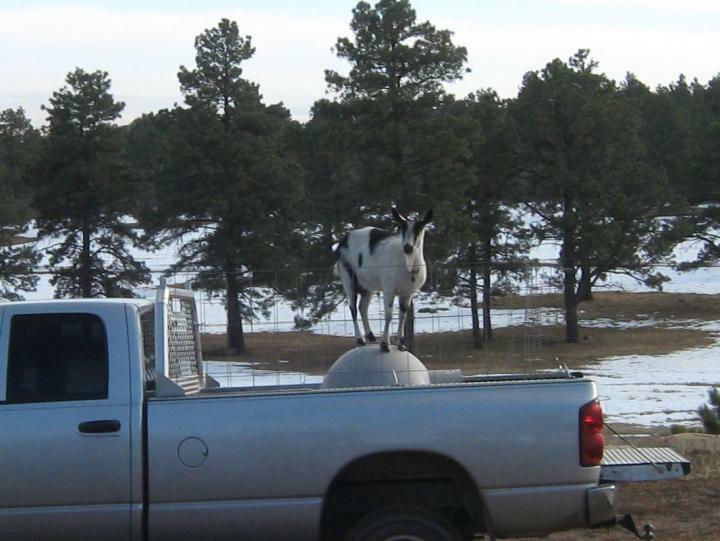 A lady in LaJunta was downsizing her goat herd and couldn’t afford to feed an extra dog and Daisy was not suited to life as a pet (apparently her family tried). 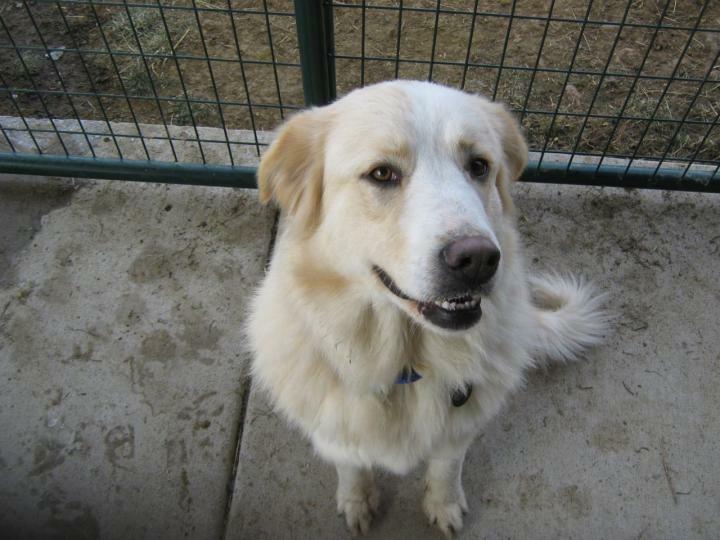 Daisy is quite obviously half Pyrenees, but I’m not so sure about the supposed Anatolian half. She’s too small, for one thing. She’s about the size of a Golden Retriever. 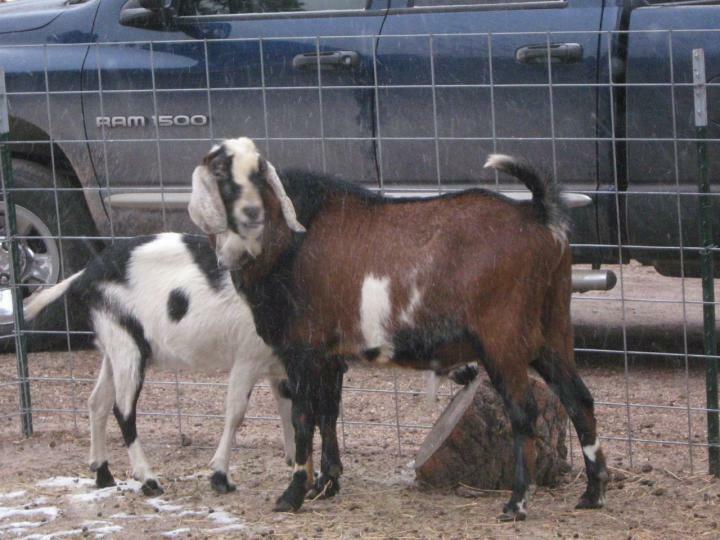 Right now my goats are afraid of Daisy and she feels the same way about them. But tomorrow I’m putting her in the pen with them and I’ll keep an eye out and make sure Cuzco doesn’t try to kill her. It will probably take a couple of weeks for her to get used her new home and her new herd, and I know it’s going to take at least that long for the goats to accept a dog in their midst. I’m not sure Cuzco ever will, but we’re going to try. So far she seems to like the goats even if she’s a bit scared of them. She was nervous the whole way home in the truck until I pulled into the driveway and she smelled my goats. Suddenly she was up on the wheel wells and trying to put her head through the cage. She cowered in the corner of the patio until I let her out to smell the yard. 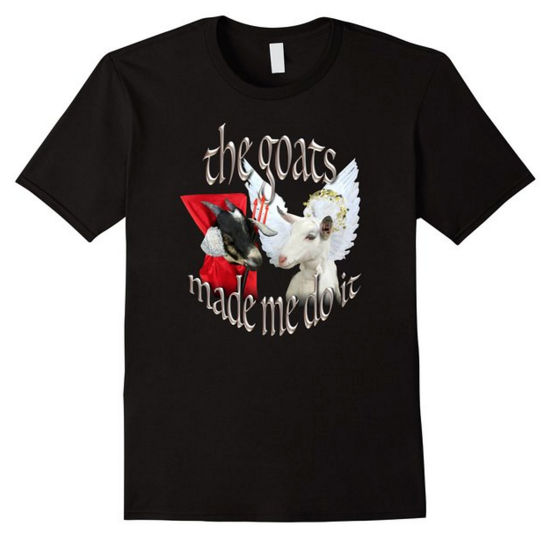 She ran from goat pile to goat pile and up and down their well-trodden path with her tail wagging. She stopped cowering after that and even went for a walk with me. We visited Nibble’s grave and I told Daisy that her job is to make sure no more goats end up in that dirt pile. I hope she takes her new job seriously! Ah… it was a wonderfully peaceful and quiet night. I slept like a rock and the goats look refreshed this morning too. Yesterday morning they were huddled in a pile, exhausted, because all of them had been on the alert all night like me. I hope Cuzco’s mood improves today. After a brief morning nap, he spent the rest of the day in a towering rage and was charging and pummeling any goat that dared to come anywhere near him. Lack of sleep and loss of his best friend probably both contributed to his temper. He’s usually at least tolerant of the babies, but yesterday they both got smacked hard any time they walked near him, and sometimes even when they didn’t. He was going out of his way to bully everyone, which isn’t his usual style. I surveyed the pen this morning and I see what happened. Since the power was off, one or two coyotes wriggled under it in a place where the ground was uneven. It (or they) fought with Nibbles down the length of the fence line. Then it got her down and dragged her to the place where it got in, but wasn’t able to drag her under the fence into the brush. I think they gave up after that and left her because they didn’t want to hang around inside a fence. Nibbles lost a lot more blood than I realized last night. It had pooled under the snow in the spot where the coyotes left her, leaving only two small spots on the surface. I feel sick about it. It’s five hours later and the coyotes are still howling at the bottom of the horse pasture. I’ve had the shotgun loaded and sitting by the door all night, but nothing close enough to shoot at. It’s uncanny how they can be so far away and yet sound so close, and they make the creepiest sound. I wish I had a dog. We’ve thought about getting one since last year, but I was kind of hoping we could wait until Cuzco is gone. He hates and fears dogs so much after his accident all those years ago that I’ve been concerned that he would leave home and never come back if we got one. 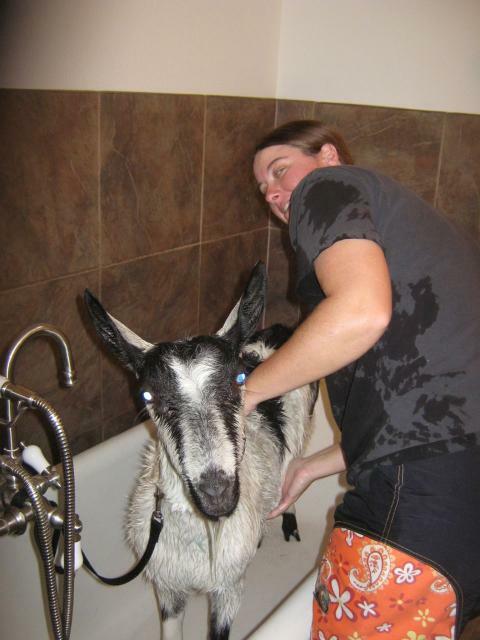 I do worry about the goats, though. Even if I hadn’t forgotten the fence, there would be other nights during the winter when I wouldn’t be able to turn it on because of the snow. Or if the charger had a problem or the battery died, I might have to wait some time to get it repaired. Nothing is foolproof, and I’ve often thought that it would be a good idea to have more than one “security system” in place. I don’t care what Cuzco thinks about it–I’m going to start making some phone calls and trying to track down a good livestock guardian dog as soon as it’s daylight. I won’t sleep properly until I’ve got someone out there patrolling this property at night. The horses have been great at getting rid of the bears, but they totally ignore the coyotes. I’ve tried telling them to be more helpful in this department, but it hasn’t left an impression. I should hope a dog would not be so indifferent.